Just How Contagious Are Head Lice? Did you just receive a notice from your child's school about head lice? Head lice are contagious and they commonly spread among kids who have close contact with each other. You should definitely check your child if you are notified they are present in children at your school or daycare. Don't panic because you have heard that head lice is going around, or even if you find lice on your child. Head lice infestations are a common problem in children, even in those who practice good hygiene and frequent hair washing. Lice only infect humans and they are spread by direct contact with someone who is already infected or by use of their belongings (such as hats, brushes or combs). Unlike many other childhood infections, they are only contagious if you have direct contact with someone else that has head lice. And that typically means direct head-to-head contact. Indirect contact with someone who has head lice is another way to get lice, although it is thought to be much less common. That might occur when the head lice crawl onto a hat, helmet, hair ribbon, brush, or comb, etc., and then your child uses that contaminated item. In addition to school, many experts think that kids are even more likely to get lice outside of school, especially at slumber parties and sleepovers. 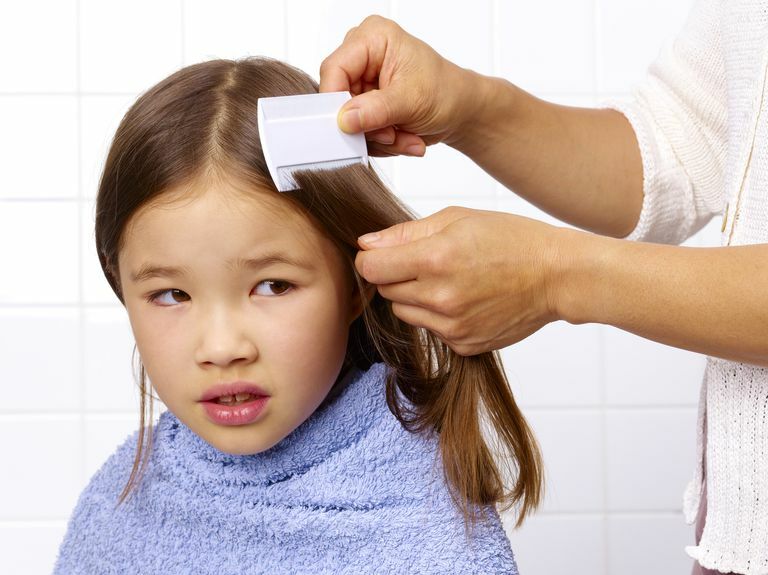 Does your child have any symptoms of head lice? The most common symptom of children infected with head lice is itching, you should definitely check your child if she has been recently itching her head or neck. However, some children do not complain of itching if they have a light infestation. Even if your child has no complaints or symptoms, if there is a head lice outbreak at school, then you should just begin checking your child regularly for live lice. Adult lice are reddish-brown and 1/16 of an inch long. They move very fast and are most commonly seen at the back of the neck and behind the ears. Nits are eggs from the adult lice and are whitish and are firmly attached to hairs. Reviewing some head lice pictures can make it helpful so you know what to look for. If you just see nits, then you should try to remove them all and continue to check your child regularly, even daily, for live lice. Do you really see new nits? It is easy to confuse nits with dandruff, hair casts, or even old, empty lice eggs. Treatment with an anti-lice shampoo will be necessary if you see live lice or if you continue to see new nits, which is a sign of a live head lice infestation. Lice can only survive for two to three days when off of the human body. The eggs hatch in 6-10 days and it then takes another two to three weeks for the lice to mature and be able to reproduce (lice life cycle). Over-the-counter Rid or Nix are still recommended as the primary treatments for kids with active head lice infestations. Prescription lice treatments or 3-week cycles of manually removing lice/nits can be considered if resistant lice are suspected. Most importantly, understand that kids don't have to be sent home from school just because they have nits or even live lice. Their parents should simply be notified so that they can be treated after school.